Citation Information: J Clin Invest. 2007;117(4):841-849. https://doi.org/10.1172/JCI30453. Obesity and its related cluster of pathophysiologic conditions including insulin resistance, glucose intolerance, dyslipidemia, and hypertension are recognized as growing threats to world health. It is now estimated that 10% of the world’s population is overweight or obese. As a result, new therapeutic options for the treatment of obesity are clearly warranted. Recent research has focused on the role that gp130 receptor ligands may play as potential therapeutic targets in obesity. One cytokine in particular, ciliary neurotrophic factor (CNTF), acts both centrally and peripherally and mimics the biologic actions of the appetite control hormone leptin, but unlike leptin, CNTF appears to be effective in obesity and as such may have therapeutic potential. In addition, CNTF suppresses inflammatory signaling cascades associated with lipid accumulation in liver and skeletal muscle. This review examines the potential role of gp130 receptor ligands as part of a therapeutic strategy to treat obesity. 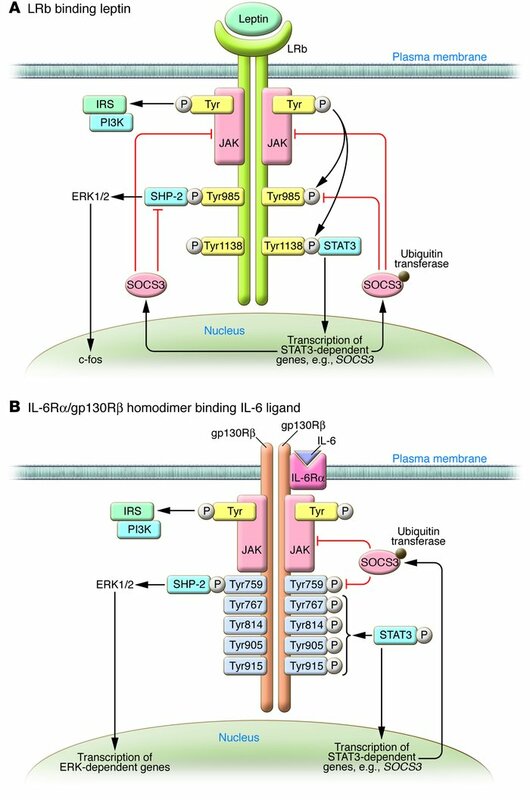 Signaling via LRb and gp130R: similarities and differences. (A) Leptin binds its homodimeric receptor LRb, which results in autophosphorylation and activation of JAK, subsequently activating the insulin receptor substrate/PI3K (IRS/PI3K) signalling pathway. JAK activation also results in the phosphorylation of LRb at Tyr985 and Tyr1138. The phosphorylation of Tyr1138 mediates the recruitment, phosphorylation, and activation of the transcription factor STAT3, resulting in the transcription of SOCS3 and other STAT3-dependent genes in the nucleus. SOCS3 inhibits leptin signaling via binding to SHP-2 bound to the LRb, recruiting ubiquitin transferases to the SOCS3 box domain at Tyr985; and binding JAK. (B) Signaling through gp130Rβ is similar to that through LRb. In the case of IL-6 signaling, IL-6 binds to the IL-6Rα/gp130Rβ homodimer, which results in JAK/STAT, insulin receptor substrate/PI3K, and ERK signaling. Importantly, however, there are 4 tyrosine phosphorylation sites (at residues 767, 814, 905, and 915) distal to the SHP-2 domain bound at Tyr759. As with the LRb, SOCS3 can inhibit JAK signaling on gp130Rβ. It is not clear why gp130R ligands may overcome SOCS3 inhibition, but it may be due to the 4 additional STAT3 binding sites, since truncation of gp130R to remove these sites does not allow ligand-mediated STAT3 phosphorylation in mice in vivo (18).